Hazem’s testimony was shocking. He told us that his family was rounded up and taken to what he called the “bedouin house” at the outskirts of the village overlooking the plains and desert that stretch out towards the east and in the direction of the US military base at Al Tanf. There, the ISIS terrorists took all the men outside and executed them in cold blood. Among them were Hazem’s father, brothers, cousin and neighbour. 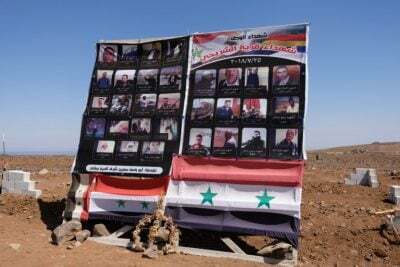 The ISIS fighters then forced the women and children to come outside to see the bodies of their fathers, sons, husbands before they kidnapped them and headed north east with 28 kidnap victims towards Tilal Al Safa. Hazem’s mother had been used as a human shield by the ISIS fighters who forced her to walk in front of them to prevent the civilians firing upon them. She was later among the kidnap victims although she and Hazem’s sister in law managed to escape and returned to the village at night. They were terrified that ISIS had taken over the village so they slept in an abandoned house just outside the village until dawn when they were able to recognise their neighbours and families who had survived and defended their village, preventing total occupation by the terrorist group.